Samsung wireless home cinema systems and Smart Home tech break cover at CES 2014 | What Hi-Fi? Details have begun to emerge of Samsung's 2014 AV line-up even before the official Samsung press conference at CES tomorrow (Monday) at 2pm Las Vegas time (10pm UK). 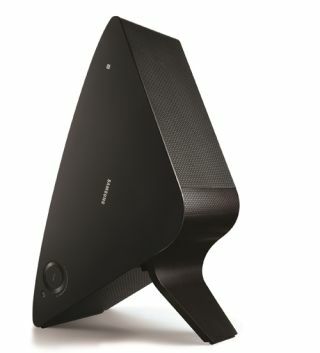 The Korean electronics giant is going big on wireless speakers and systems, with two new wireless speakers – the M5 and M7 – as well as the wireless HW-H750 soundbar, a new Blu-ray/valve amp 7.1 surround sound system with wireless rear speakers, and its own variation on a soundbase, the HW-H610 Sound Stand. Samsung says the M5 and M7 wireless speakers can be used alone or in combination to create a multiroom system. Alternatively, two M5s or M7s can be paired to create a stereo pair, or used in 5.1 configuration for full surround sound. The HW-H750 wireless soundbar can also be combined with two M5s or M7s to make a fully wireless system. The soundbar uses valve amp technology to deliver 320W of power (claimed) and is, according to Samsung, the company's "most advanced soundbar to date". Valve amp technology is also used in the HT-H7750 7.1 system which includes a 4K upscaling Blu-ray player, wireless rear speakers and incorporates Samsung's 2014 Smart Hub. If you want a standalone soundbase to sit under your TV to boost its sound, Samsung says its new HW-H610 Sound Stand is designed to fit with TVs from 32in up to 55in. It includes a "sleek design, active crossovers and vibration reduction technology" and can be connected to your TV wirelessly. Guy Kinnell, Samsung UK's head of TV and AV, says: "Our 2014 line-up not only produces superior sound and breakthrough design, but also the flexibility of wireless support." All of Samsung's 2014 wireless products can be controlled using a free smartphone app, either via the product itself or by using the optional Samsung Hub which connects to a router to control multiple speakers and sources. Also announced at CES 2014 is Samsung's new Smart Home, a service enabling Smart TVs, home appliances and and smartphones to be connected and managed through a single platform. Customers will be able to control Smart TVs, refrigerators, washing machines, digital cameras, smartphones and even the wearable Galaxy Gear through an integrated platform and server. For example, they can use customised settings on their mobile or Smart TV to turn on the lights or air conditioning whether at home or away, or by just saying "Going Out" to their Galaxy Gear home lighting and selected devices would automatically be switched off as they left the house. With the service's Home View feature, users can get a real-time view of their home when away using cameras built into various appliances, which will then send images to their smartphone. Samsung Smart Home will be rolled out in the first half of 2014, and the company says it will work with other companies to make Smart Home compatible with their products and services too. We'll bring you more details of these and other exciting developments after the Samsung CES press conference tomorrow, so stay tuned to whathifi.com for all the latest tech news.